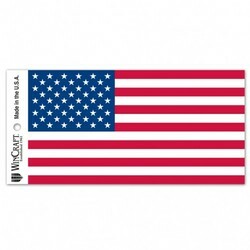 shop American Flag Decal 3x12 Bumper Strip Style | bargainbrute. Officially licensed decal strips. Decal strips can be placed on a variety of surfaces, not just a bumper, with their self-adhesive back. Measures 3x12 inches. Made in USA. Made by Wincraft.